In a world of constant change, it is increasingly important to keep up with the latest updates and user needs. Thus, in the field of web design and development we are constantly focused on staying updated to new trends and implementing new solutions for greater user experience with their so many resolutions and devices. Who would have thought that we would be able to carry the real Internet in our pockets 5 years ago? But designing for so many phones and devices in every size imaginable proved to be a real challenge that found its solution in responsive web design. Responsive web design is a new web development approach suggesting that the development and design of a website should respond to user’s behavior and environment, including platform, screen size and orientation. More simply put, responsive web design is the technique of adapting a website’s design to multiple resolutions and devices. Thus, as the user switches from laptop to smartphone, the website should automatically accommodate for the new resolution and image size. This means that the website is technically created to automatically respond to user’s preferences. To sum up, the two most important qualities of a responsive web design are adjustability and flexibility. Why should you use responsive web design for your business’ website? There are many reasons for using responsive web design on your business’ website. Given the rapid adoption of smartphones and tablets, and also the fact that users currently tend to prefer reading their news on the mobile first rather than on desktop devices, responsive web design seems the perfect solution for reaching readers and ensuring a great experience on every screen. “Day by day, the number of devices, platforms, and browsers that need to work with your site grows. Responsive web design represents a fundamental shift in how we’ll build websites for the decade to come”. You’ll need to keep up with your customers and their devices. There is an increased tendency to buy tablets and smartphones instead of computers, so it is a great possibility that people will need to navigate on your website using multiple devices. Therefore, you need to be prepared and have perfect adjustable and flexible website design that would automatically respond to your user’s mobile devices or tablets. By using responsive design you’ll make sure that everyone is able to access your website no matter what type or size they are using. For a better understanding of how responsive web design is implemented to websites, here you have some examples of how websites respond to different devices. Web designers are increasingly using this new concept of responsive web design when creating websites, but sometimes it happens that they engage in creating beautiful responsive websites, forgetting that websites are mainly designed for the purpose of human interaction. Thus, it is important to still follow the first basic law of web usability, which says “Don’t Make Me Think”. This concept was introduced by Steve Krug in his book “Don’t Make Me Think: A Common Sense Approach to Web Usability” (2000). Krug’s main idea was that, despite the rapid change in the world of web design, there is one thing that should never change: the purpose of websites. Therefore, web designers should always have in mind that websites’ main purpose is to offer users the information they need, without making them think. Users should quickly understand what to do on websites and where to look for what they need, and not to start thinking about where to start and where to click. 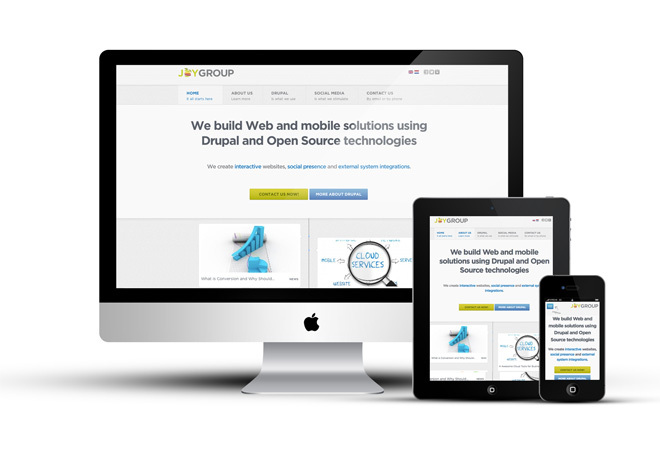 Considering the fact that mobile and tablet use will overcome desktop use, here at Joy Group we are constantly focused on the best practices for coding responsive web design for businesses. Our process’ center of attention is on both separate design concepts and the unity of the website among the three different devices: desktop, tablet, and mobile. If you need a user-friendly and touch-friendly website, contact us and let’s build together a responsive web design that will help your customers and clients reach you easily on every device.